If during your next trip to Madrid you were thinking of going on day trips somewhere not far from the city, a visit to the historical town of the Royal Site of San Lorenzo de El Escorial and the Loyal Town of El Escorial has to be on your itinerary. Added to the natural wealth of one of the most stunning landscapes in the region is, thanks to the wishes of the monarch Philip II, one of the most outstanding architectural monuments from that time: the Monastery of San Lorenzo de El Escorial, an Herrerian masterpiece located just 36 miles from Madrid. Today we propose an original way of getting there which is a unique experience in itself: the Philip II Train, a 50-minute journey in a train from the Early-Twentieth century pulled by a locomotive which dates from 1960. 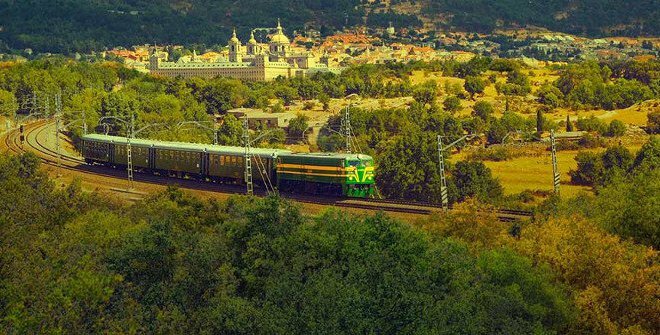 During the journey, you will be entertained by characters from the court of Philip II, who allow travellers not just to move in space but also back in time, to the imperial splendour of the Spanish royal family. There are different fares which include visits to the monastery, the gardens and the Royal Site’s market, the town of El Escorial in itself and the Official Houses, which are located nearby and are also of tourist interest, such as the Prince’s House, the Infantes’ House and the Charles III Coliseum. The train leaves Príncipe Pío Station at 10.20 a.m. and returns at 4.30 p.m. and 6.30 p.m. depending on the time of year. Check out the calendar and timetables to plan your visit. Prices range from 15 to 27 euros depending on the age group and monuments included in the ticket, with discounts available for groups and families.